At the National Extension Workshop conference carried on September 27th, 2017 in the province of Camagüey, doctors from the provinces of Cienfuegos and Sancti Spíritus presented their evidence and application results on the effectiveness of the use of Heberferon for the treatment of Gorlin Syndrome. Gorlin Syndrome, also known as Nevoid Basal-Cell Carcinoma Syndrome (NBCCS) is an inherited medical condition and a genetic disease involving flaws within multiple body systems such as the skin, eyes, bones, nervous system, and endocrine system and which could lead to the appearances of multiple Basal Cell Carcinoma (BCC). In spite of the fact its occurrence is rare, Gorlin syndrome causes extensive deterioration in the quality of life. Gorlin Syndrome conditions usually proceed multiple basal cell lesions. In his presentation, Dr. Damaris Díaz Leonard, from Cienfuegos, discussed the medical case of a patient suffering from about 200 carcinomas throughout his body, and who has undergone various surgical procedurein the face region which resulted in deformities. Dr. Leonard was backed by his colleague, Dr. Yilian Castro Maricy who also presented three similar patients suffering from Gorlin Syndrome. In his presentation, Dr. Maricy of the Camilo Cienfuegos Hospital in Sancti Spíritus, offered evidence showing that the application and treatment of these patients utilizing Heberferon has resulted in either total recovery in some lesions and partial and stable recovery in others, as well as the elimination of the possibility of the appearance of new carcinomas. 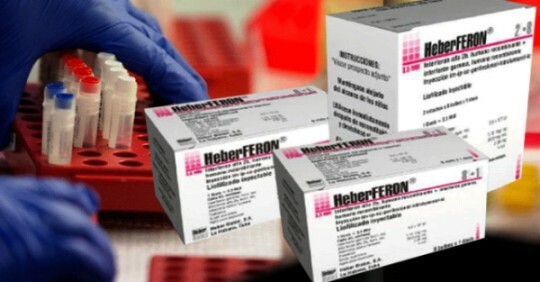 Heberferon is an alternative vital to reducing or avoiding recurrent surgical procedures while improving esthetics and quality of life for those suffering from the disease. Its effectiveness is in its ability to regulate components of the Hedgehodsystem, which is a system that plays a part in embryonic development which, in patients suffering from the Gorlin Syndrome, leads to mutation and tumor production and triggers lesions spread over almost the majority of the skin area.